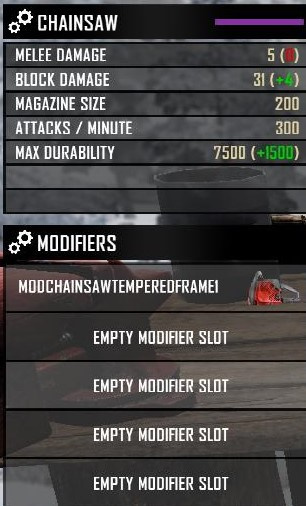 Adds attachments specific to the Auger and Chainsaw, which also have 8 slots at tier 6. Upgrade your nail gun to the Quicker Fixer Upper. All these added into the loot and progression tables! 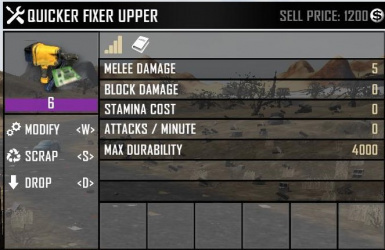 quality damage bonus to Auger, Chainsaw, and impact wrench. Fixed a missing variable in my FINDSTR in the the localization.bat that was removing all the engineering entries in the vanilla localization. Be sure to validate your steam file before redoing your .bat's so that your engineering is fixed. was missing a part in the windows.xml that made that patch fail to load. corrected the mistake and now should load fine. *Thanks to Elucidus for allowing me to use the Impact Wrench as part of this mod and looking forward to adding some unique attachments meant for it! *Thanks to Mayic for catching the error in my localization.bat that was removing the engineering entries from the vanilla localization file. 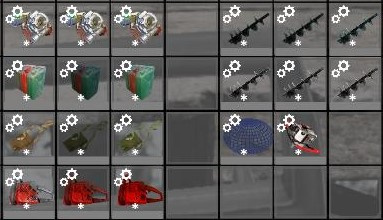 This is now fixed, if you used this particular .bat file you may have noticed no entries in your engineering related items and abilities. Validate your steam folder and than redo your .bat files. I had used the word Engine rather than modEngine so all entries with Engine were being removed when running this .bat. 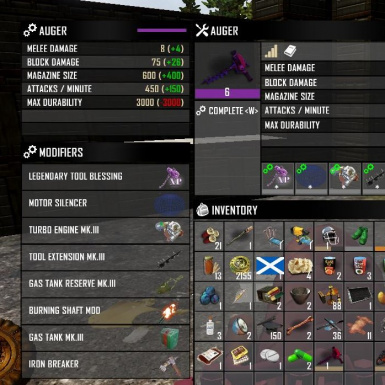 Adds the 8 slots to the Chainsaw and Auger at tier 6 (***note this will not update your existing items and requires them to either be crafted or found new). Quality damage bonus is added to the tools. 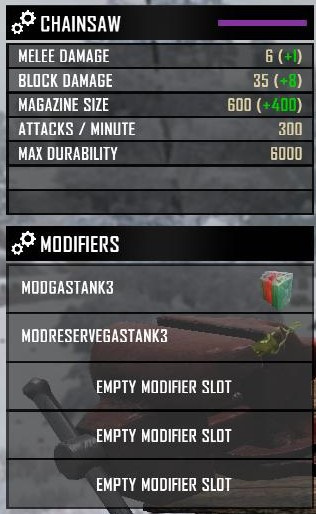 modMotorToolSilencer = makes it so you can now mine and chop in peace. 6. Figure out how the tools affect the heatmap and if it can be separated from the sound values or if those are intrinsically linked. If it is separate and there is a heat specific value than a heat sink could be developed to soak up the heat rather than the Noise Dampner doing both. 7. Considering making a Reserve Fuel Tank attachment that would allow for a 2nd fuel tank attachment for even more fuel. 9. Recipes built/balanced and added into the progression tables. 10. loot.xml additions so the added items can be distributed. 12. 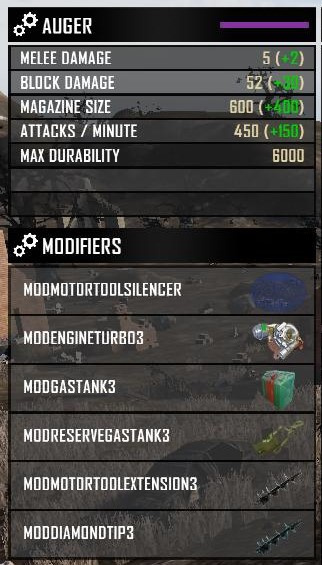 Impact Wrench unique mods. 13. Get a lawnmower icon in and see if something in hold position could be a good candidate for a future model addition of a lawnmower. 0.10 see changelog and all future version changes will be included in there. 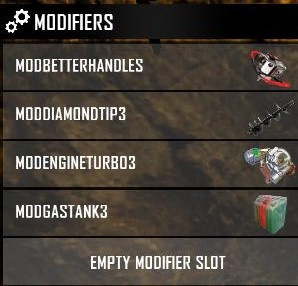 -now there should be more occurrences of the mods appearing in loot. -RussianDood compiled a localization file for the mod. ﻿﻿-Thanks to RussianDood the progression and sound file should now work. -adding the progression file and putting the recipes in to be bound to the gating system. 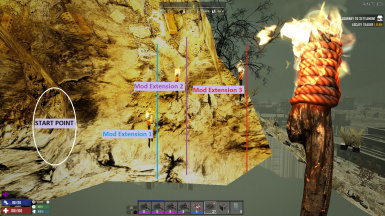 -added Chainsaw Tempered Frame mod (be careful this is a permanent attachment to your chainsaw and you can't change it out. adds in original icons for Better handles, Gas tank (looks too much like a present and will likely change), and Engine Turbo. No stat changes at this time. Added in Better Handles to reduce kickback/recoil and added an icon for the auger blade.